California's desert parks provide some of the best opportunities to see the night sky as our distant ancestors did—a rich tapestry of stars, undiminished by the artificial light of civilization. Death Valley National Park, in fact, recently became the world's largest certified International Dark Sky Park. Southern California's Joshua Tree National Park hasn't yet earned such a designation, but it's a classic stargazing destination where the otherworldly shapes of Yucca brevifolia cast silhouettes against a pristine night sky. 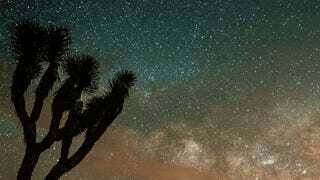 Photographer Gavin Heffernan, who previously made this mesmerizing timelapse in Death Valley, visited Joshua Tree over the weekend to capture the Camelopardalid meteor shower pass over the park.